Tim Brabants MBE will be competing in the 2009 Sark to Jersey rowing race on the 4 July. 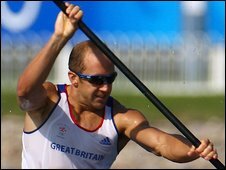 Brabants won a gold and a bronze for kayaking at the Beijing Olympics and is in the middle of his preparations for the 2012 London Olympics. Boats start from Dixcart Bay on the south coast of Sark and head to Bonne Nuit Bay on Jersey's north coast. Brabants said: "The 19 mile rowing race is very different to kayaking but I think I'm fit enough to do it." Brabants has a link to the islands as the doctor worked in Jersey's general hospital in 2005 before leaving to concentrate on his sporting career.